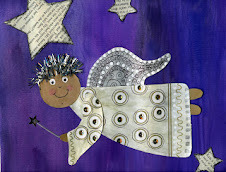 I know there are alot of clothespin angels out there, but this is an easy version that your kids can make. I think they look great on the Christmas tree. I recommend you stick with felt as your dress material....it glues well to the clothespin. You can use gold, silver or whatever you have on hand for your accent colors. Paint the ends of the clothespin. I'm using silver. These are the feet of the angel. Using fine markers, we use microns, draw a face on your clothespin. Just a simple 2 dots for eyes and a smile. Cut a piece of felt about 2 3/4" by 2 1/2". I cut the bottom of the dress with pinking shears for a decorative edge. Apply some tacky glue to the clothespin where the dress will go. Wrap the felt around, get the top corners to overlap slightly. This will give your dress a triangular shape. It may be open a bit in the back but that's OK ......after all its the back. Cut a piece of ribbon for the arms, about 3 inches long. 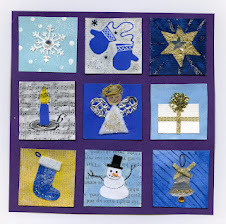 I used an iridescent one which is not very visible in the photos. 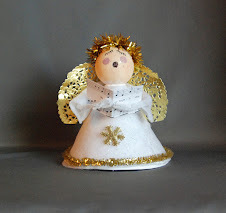 Put some glue in the back of the angel at the top of the felt, put the ribbon into position. Put a bead of glue on the ribbon ends and then glue to dress angling down like a pair of arms. Put glue on the back and top of the head. Add wool roving or stuffing for hair. Don't fuss too much with it, you can thin it out after the glue dries. If you do it now you just end up with fuzz all over your fingers. Cut a pipe cleaner about 3 inches long and form a ring. Put some glue on it and place the halo on top of the head. Glue on some sequins to the dress for some extra sparkle. Take your flower apart and cut off two petals. If they have a plastic spine leave it on, it helps the wings hold their shape. Glue the wings into place. Add a hanger. I just threaded a needle with gold thread and passed it thru the felt dress at the back. Tie into a loop. There you have it, a simple clothespin angel that's very easy to make and very cute in your tree. 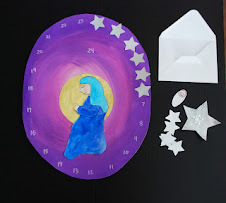 I've just been going back through your archives :)) These are gorgeous - I'm going to make some with my 8 year old for her to give out to friends this Christmas.